Gertrude Franklin Horn Atherton was an American writer. Gertrude Franklin Horn was born on October 30, 1857 in San Francisco to Thomas Ludovich (in business) and Gertrude Franklin Horn. Her paternal grandfather, Stephen Franklin, was a devout Presbyterian, insisted she be well read, and this influenced her greatly. She eloped with George H.B. Atherton, son of Faxon Atherton, on February 14, 1876. She was only 19 at the time, and later had two children with him. Two tragedies changed her life dramatically: Her son George died of diphtheria, and her husband died at sea. She was left alone with her daughter Muriel and needed to support herself. She wrote Doomswoman in 1892, and it was published in Lippincott's Monthly Magazine before being published in book form in 1893. The story focuses on Chonita Moncada y Iturbi and her love of Diego Estenega (modeled after Mariano Guadalupe Vallejo), as he dreams of modernizing California, retaining its Mexican character without sacrificing American economic vigor. Chonita is Catholic, and her faith stands in the way of Diego's political ambitions. The dramatic climax peaks when Diego kills Chonita's brother, Reynaldo, and she is forced to choose between her cultural loyalty or the love of her life. This story closely resembles Romeo and Juliet. The book was successful with critics, some comparing it to Helen Hunt Jackson's Ramona. Atherton was not pleased with this because Jackson was not from California. However, she was satisfied when Bierce said it was "as in its class . . . superior to any that any Californian has done". In 1892, Atherton left for New York. There she wrote for the New York World. She also wrote letters to Bierce, confiding her loneliness, her dismay at the necessity to do freelance writing (in particular the New York World), and even how much she disliked eastern literary circles. Her distaste came from their belittlement of the West and their authors, and the fact they did not accept Bierce's work. She next wrote Patience Sparhawk and Her Times, A Novel (1897), but it proved to be too controversial. This rejection encouraged her to leave for London. It was 1895 and John Lane of The Bodley Head agreed to publish it, but not for two years. She continued to write, writing book reviews for Oliver Fry's Vanity Fair and even completed The Randolphs of Redwoods, (retitled A Daughter of the Vine, 1899) while staying in Haworth. Once Patience Sparhawk and Her Times, A Novel was published, William Robertson Nicoll gave a review of it in the April 12, 1897 edition of The Bookman and said it was "crude" in its portrayal of a clever young woman with burning interest in life and identified it as a protest against the tame American novel. In a May 15 issue of The New York Times, the reviewer said that Atherton had "incontestable" ability and a "very original talent" while noting that the book offered a series of "fleshy" episodes in Patience's life that must have scared a sensitive reader. The year 1898 saw her complete The Californians, her first novel in the post-Spanish era. Critics received this much more than Patience and a review in the The Spectator in the October 1, 1898 issue said it "was by far more convincing and attractive in delineating California manners and morals. . . . The novel fairly establishes her claim to be considered as one of the most vivid and entertaining interpreters of the complex characters of emancipated American womanhood." The November 8 Bookman said it was her "most ambitious work," which has "a feeling of surety that only the consciousness of knowing one's ground can convey". She traveled to Rouen and wrote American Wives and English Husbands (1898), set in contemporary time. In this novel, she contrasts English and American men, American and English civilizations, and the relationships between men and women. She also completed The Valiant Runaways (1898), an adventure novel for boys that dealt with the Spanish Mexican attempt to civilize California. 1899 saw her return to the United States. Her novel Senator North (1900), was based on Maine's senator Eugene Hale. She is best remembered for her "California Series", several novels and short stories dealing with the social history of California. The series includes The Splendid, Idle Forties (1902); The Conqueror (1902), which is a fictionalized biography of Alexander Hamilton; and her sensational, semi-autobiographical novel Black Oxen (1923), about a upper middle-age woman, who miraculously becomes young again after glandular therapy. The latter was adopted into the film Black Oxen in 1923. Her novels often feature strong heroines who pursue independent lives, undoubtedly a reaction to her stifling married life. "The Foghorn," written in 1933, is a psychological horror story that has been compared to The Yellow Wallpaper. W. Somerset Maugham called it a powerful story in a 1943 publication of his, Great Modern Reading. In 2009, The Library of America selected Atherton’s story "The Striding Place" for inclusion in its two-century retrospective of American Fantastic Tales. 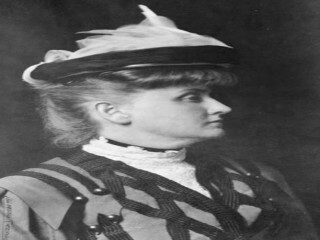 View the full website biography of Gertrude Atherton.